By D Magazine | 8 years ago Our annual list, plus some of these top local designers tell us about the looks they like best. By Shawn Williams | 8 years ago Dallas businessman David Litman cultivates a natural Texas environment on his Preston Hollow estate — whether his neighbors like it or not. By Rhonda Reinhart | 8 years ago When Peggy Levinson saw the view at this waterfront home, she knew she had to have it. By Laura Kostelny | 8 years ago Regan and Zach Carlile were crushed when the house they had their hearts set on fell through. But then they fell in love all over again. 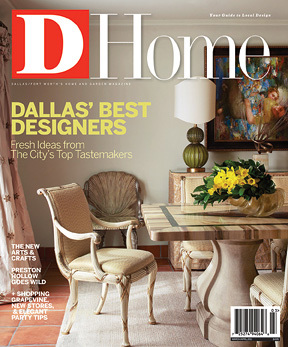 By D Magazine | 8 years ago This North Dallas house is listed for $11.5 million. By Todd Johnson | 8 years ago In DUO: All Things Culinary, Lynae Fearing and Tracy Rathbun have created one tasty shop. By Laura Kostelny | 8 years ago 20c Design takes things offline in its new showroom space. By Dawn McMullan | 8 years ago It's a conservation district to treasure with a central Dallas location that's hard to beat. By D Magazine | 8 years ago Five bedrooms in Far North Dallas, a furnished Preston Hollow home, or half an acre in a gated community. By D Magazine | 8 years ago A Lakewood bungalow, a recently updated Bent Trail home, or three bedrooms in Hollywood Heights. By D Magazine | 8 years ago A four-bedroom Mediterranean, a Lakewood Estates home, or a two-story house in Kessler Woods.